From the lookin' at me department... Wale @ Republic Live tomorrow night, Feb 12th! Olubowale Folarin (born September 21, 1984), better known by his stage name Wale (pronounced /wɑːleɪ/), is an American hip hop artist from Washington, D.C. He rose to prominence in 2006, when his song "Dig Dug (Shake It)" became popular in his hometown. Wale became locally recognized and continued recording music for the regional audience. Producer Mark Ronson discovered Wale in 2007 and signed Wale to his Allido Records in 2007. While signed to that label, Wale released several mixtapes and appeared in national media including MTV News and various urban magazines. 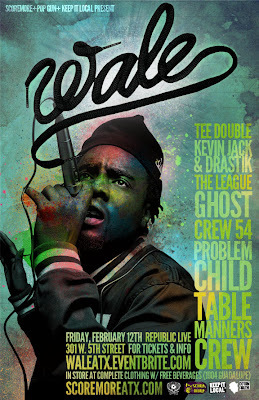 In 2008, Wale signed to Interscope Records, and his debut album Attention Deficit was released in 2009 with the singles "Chillin", "World Tour", and "Pretty Girls". Wale was born in Washington, D.C. His parents are of the Yoruba ethnic group of southwestern Nigeria and came to the United States from Austria in 1979. He has two older brothers, one of whom, Alvin, lives in New York City working for a record label. Wale's family first lived in the Northwest section of Washington. His father worked as a cab driver in the D.C. area. He graduated from Quince Orchard High School in Gaithersburg in 2001 and moved to Largo, Maryland in 2003. Wale attended Robert Morris College and Virginia State University on football scholarships, then transferred to Bowie State University but dropped out. Wale's boyhood love of the game of football and the Washington Redskins has led to a longstanding rumor that Wale has a tattoo of tight end Chris Cooley.